"Your whole life lies ahead of you. You want to be happy. You want to marry a good boy who will love you forever. But you have to deserve it." It is 1965 in the Czech town of Zruc, and Andula (Hanu Brejchovou) is a young factory worker living communally with dozens of other women, all forced to relocate to the desolate province by the government. She longs for a lover, for a sexual relationship, and a romantic one, but the women in Zruc outnumber the men sixteen to one. Milos Forman directed this comedic social critique while living in Communist controlled Czechoslovakia, and the story is full of sly commentary. As the film opens, the factory manager suggests that a group of soldiers be stationed in town to give the woman "what we needed when we were young." The troops march in, a whole trainload of them, and the factory workers look on, dully sizing up the unimpressive group of aging, fattened militia. Forman doesn't dwell on the loss of freedom or the women's sense of imprisonment, but it makes clear that they are at the mercy of an impersonal government that cares only for their productivity level. If men will keep them happy, then they must be happy with these men. Andula, however, is not. The film can be easily broken into three acts, and in the first, she sits with two of her friends at a company-sponsored dance. They notice three older soldiers leering at them from across the room. As the girls moan about the lack of quality men, the guys try to work up the courage to ask the three for a date. It is certainly the film's funniest scene, as the girls toy with the men, but have apparently resigned themselves to the fact that, in Zruc, they can do no better. But then Andula catches the eye of Milda (Vladimira Pucholta), the young piano player at the dance. In the second segment, Andula and Milda retreat to his apartment for a decidedly unusual love scene. At first, she seems tentative and unwilling, then finally she acquiesces, and at the end of the night, she is convinced she has found her one true love. Milda, obviously the perp in more than a few one night stands, promises he'll write, and says that she should really come visit him at home. Andula promptly goes home and breaks up with a homely local boy who had been courting her attentions. Andula, it seems, has found the love she was seeking, but her notions of love are immature, adolescent—sweet nothings whispered in her ear, lying naked and talking—and disappointment looms. In part three, Andula leaves the dormitory and travels to Milda's house, where she encounters his parents (Milada Jezková and Josef Sebanek), who clearly can barely stand one another (a much more realistic depiction of marriage, to be sure). Milda isn't home (he's out with another girl), and his parents argue about Andula staying over. When he finally does show up, it takes him a few minutes to recognize her, and he quickly explains that she shouldn't have come and that she should leave. Andula's ideal love turns out to be unattainable, and she sadly travels back to Zruc and her mindless factory job. Forman has fun with his characters, and there are some truly amusing moments, but it never feels like we are laughing at their expense. Andula is foolish, but her idealism is endearing, and it is disappointing when her youthful exuberance breaks down in the face of middle-aged malaise. The cast, led by professionals Brejchovou and Pucholta, is filled out with non-actors and first timers, lending a natural, realistic feel befitting of the downbeat storyline. Image Transfer Review: Loves of a Blonde is nearly 40 years old, and the original elements are showing their age. The source print for this transfer shows a few glaring defects—including a scratch that stays onscreen for a good five minutes and a number of smaller tears and dirt marks—but Criterion seems to have done at least a partial restoration. The black-and-white picture is fairly crisp and stable throughout, with good detail and acceptable showdown detail. Blacks aren't truly solid, but overall, this isn't a bad transfer for a low-budget foreign film. Audio Transfer Review: The original mono mix isn't always a pleasurable experience. Dialogue is always clear, but has a tendency to sound shrill and unsupported, especially when characters are shouting. The score lacks fidelity, and the upper register sounds pretty harsh. I also had to frequently adjust the volume, turning it up during talky scenes and turning it down when there was a lot of music. An acceptable track, but I've heard many older mono tracks that sounded far more natural. Extras Review: Loves of a Blonde is a "second tier" Criterion release, and with the lower price comes fewer supplements, but what's included is worth a look. An interview with director Milos Forman runs for around 15 minutes. He talks mostly about working under close government scrutiny and the special challenges of filming and casting Loves of a Blonde. It's a bit dry, but interesting (though Forman's accent is a bit hard to decipher at times). There is also a lengthy deleted scene, a five-minute comedic bit in which Milda tries to sneak into the bedroom of another beautiful blonde. The insert includes an informative essay by critic David Kehr. 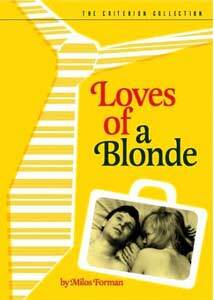 Loves of a Blonde is a surprisingly funny film considering the downbeat storyline, and it's one of Milos Forman's most accessible early works. The Criterion release is a bit light on supplemental material, but the audio and video transfers are fine, and fans of the film or the director would do well to add this one to their collection.